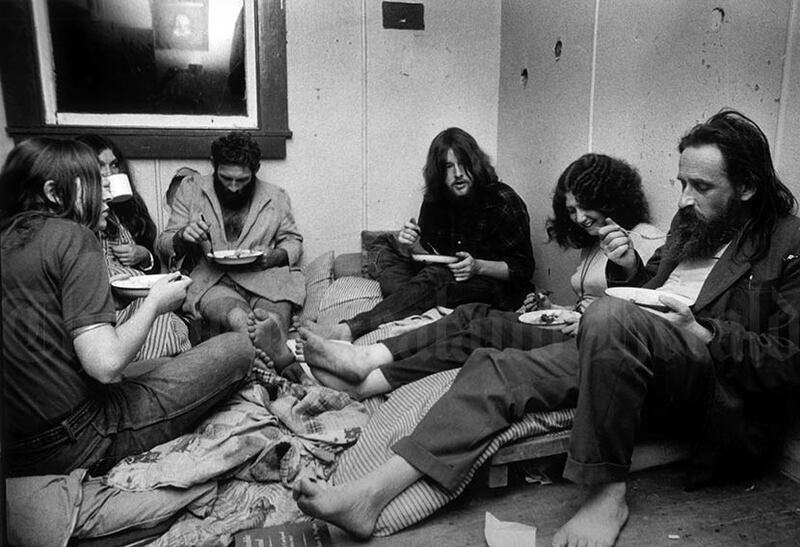 Poet James K. Baxter (right) and other Jerusalem commune residents tuck into a feed in December 1970. Baxter founded the community at the small Māori settlement of Jerusalem on the Whanganui River, in the hope of learning 'from the Māori side of the fence' and incorporating Māori spiritual and community values. He referred to the residents – who included alcoholics, drug addicts and people with mental health problems – as 'ngā mōkai', which he translated as 'the fatherless'. A huge tangi was held for Baxter at Jerusalem after his death in October 1972, and he is buried at the settlement on tribal land.